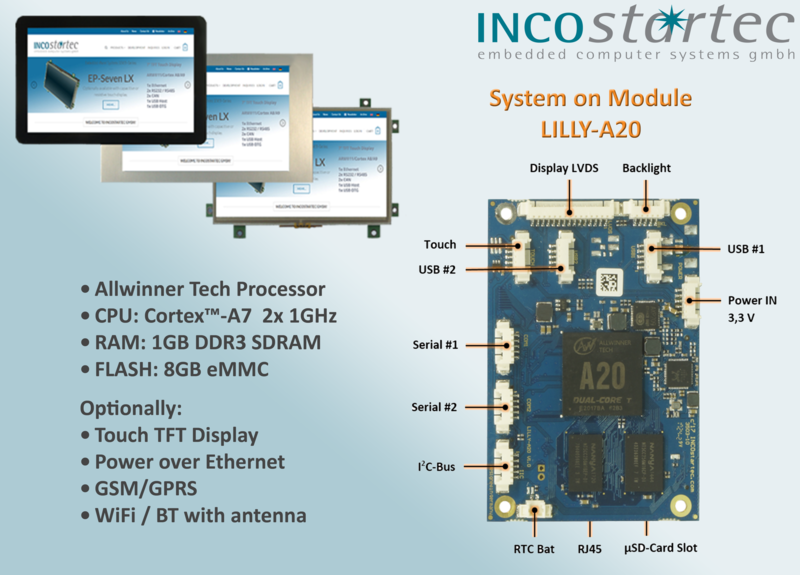 With the Embedded Single Board Processor Module LILLY-A20-SBP from INCOstartec is a super small sized (74x51x6mm) Board with A20 Dual Core, Cortex A7, 2x 1GHz from Allwinner created. Because of the software compatibility to the „Banana PI“ it is suitable for various applications. As Embedded Single Board Prozessor it can be connected to displays of 2,4 up to 15Inch directly over LVDS, as well as Backlight and either resistive- or capacitive touch interface. The LILLY-A20-SBP is power supplied of 3,3V. The interfaces 2xUSB, 2x Serial, 1x Ethernet, 1x I²C-BUS are available via seperated plugs and can be used directly. In the system is a RTC with battery integrated and a µSD-Card Slot besides an on-Board eMMC Flash Memory for Bootloader, OS (LINUX, ANDROID and Win Embedded Compact 2013) and user application are available. The RAM can be equipped with up to 2GB. Optionally can an USB interface be replaced with a WiFi Module to represent the suffice the IoT claims. More optional periphery extensions can be done by a pair of 100/140Pins. Therefore there are adapter modules as for GSM/UMTS/LTE or GPS and more on customers request. This low-cost system LILLY-A20-SBP Eval kit with 5,6 or 7Inch touch display can be a good entry.